Beetroot cake is the hero of vegetable-based cakes – moist, tasty and full of goodness. Nigel Slater shows you how. Preheat the oven at 180C/350F/Gas 4. Lightly grease a rectangular loaf tin (20cm x 9cm x 7cm/8in x 4in x 3in), then line the base with baking parchment. Sift together the flour, bicarbonate of soda, baking powder and cinnamon. Beat the oil and sugar in a food mixer until well combined, then introduce the egg yolks one by one, mixing after you add each egg yolk. Grate the beetroot coarsely and fold it into the egg mixture, then add the lemon juice, sultanas (or raisins) and the assorted seeds. Pulse until combined. Fold the flour and raising agents into the egg mixture whilst the machine is on a slow setting. Beat the egg whites until light and almost stiff. Fold gently but thoroughly into the cake mixture, using a large metal spoon (a wooden one will knock the air out). Pour the mixture into the cake tin and bake for 50-55 minutes, covering the top with a piece of foil after thirty minutes. Test with a skewer for doneness. The cake should be moist inside but not sticky. Leave the cake to settle for a good twenty minutes before turning out of its tin onto a wire cooling rack. To make the icing, sift the icing sugar into a bowl and stir in enough lemon juice or orange blossom water to achieve a consistency where the icing will run over the top of the cake and drizzle slowly down the sides (about three teaspoonfuls), stirring to remove any lumps. 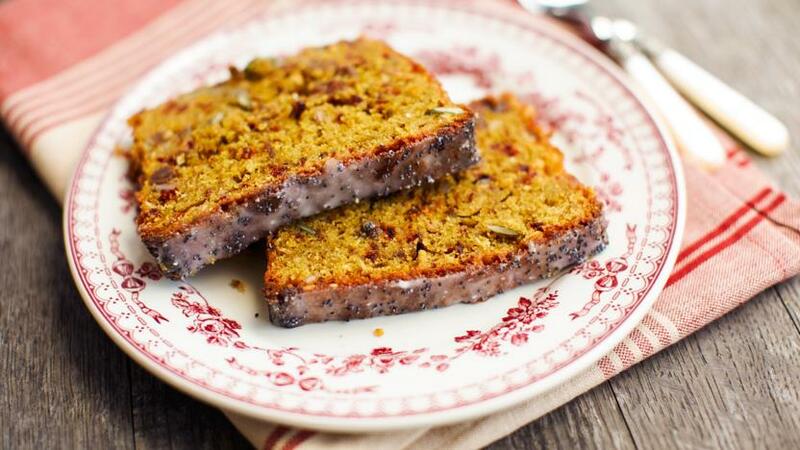 Drizzle it over the cake and scatter with the poppy seeds. Leave to set before eating.